Shinas College of Technology (ShCT) is located in the Wilayat of Shinas in the Governorate of Batinah, about 69 kms from the city of Sohar, in the Sultanate of Oman. It is one of the seven Colleges of Technology under the Ministry of Manpower. 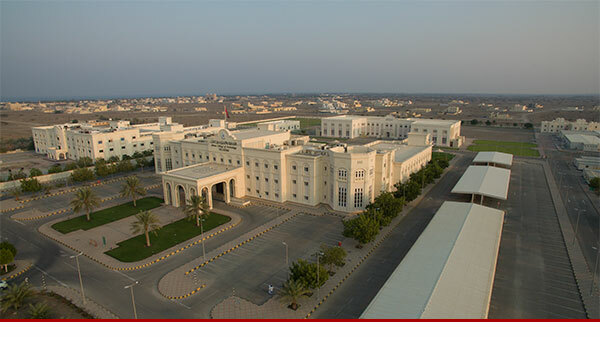 The College is a public institution catering to higher educational needs of Omani youths. It offers programs leading to diploma, advanced diploma and bachelor in the fields of Engineering, Information Technology and Business Studies. The institution was established in December 2005. Since then it has undergone rapid growth, offering programs to suit the market needs. It started with 550 students and 15 staff in the foundation program. Students joining the College are placed in different levels of the foundation program based on a placement test they take. On successful completion of their General Foundation Program, students move to the post foundation level in different academic departments. The College has three academic departments: Engineering, Information Technology and Business Studies. The Engineering Department offers 3 programs: Mechanical, Electrical and Civil engineering up to Bachelor levels. The IT department offers specializations in Database, Internet and e-Security, Network and Software up to Bachelor levels. The Business studies offers 3 programs. The specializations currently offered are Accounting and Human Resource up to Bachelor levels; and Marketing up to advanced diploma level. A credit-based system is followed in the specializations at the post-foundation level. The details of study levels and system of programs are indicated in Bylaws. The College Dean is supported by 3 Assistant Deans, (Academic Affairs, Student Affairs and Administrative and Financial Affairs) and Heads of English Language Center and Educational Technology Center. The Assistant Dean for Academic Affairs supervises the 3 academic departments. The Assistant Dean for Students Affairs supervises the heads of the departments of Admission and Registration; On-the-Job Training; Counseling and Graduates Follow-up; Housing, Student Activities and Graduation. The Assistant Dean for Administrative and Financial Affairs supervises the heads of Administration, Finance, and Human Resource departments. The College has a total land area of 120,000 square meters. There are six blocks in the College. These six blocks are Main, Engineering, D, E, Workshop and ELC. The Main block houses the administrative, student affairs, IT and business studies department amd educational technology center staff, computer laboratories and classrooms, canteen, clinic and library. The Engineering block houses the Engineering department, multipurpose hall, auditorium and laboratories for engineering. The D and E blocks house ten classrooms each. The Workshop and ELC blocks house Engineering workshop and English Language Center respectively. The campus also has designated parking areas for staff, a football field and a sewage treatment block.